With issues of his own, an ex-army officer-turned-lawyer defends an impoverished young cowherd of killing a baby. A team of 20 men and more than 200 sled dogs race against time and harsh weather conditions to combat an epidemic of diphtheria afflicting a Gold Rush town deep in Alaska. An excellent film on a universal dilemma. Both white and black may be possessed by demons. These evil spirits needs to be removed. This unique film explores the depth of possession across two cultures, one a white lawyer, the other a black herdsman. 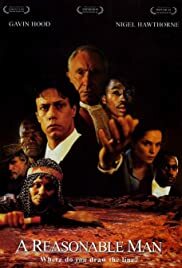 Set in KwaZulu-Natal in South Africa, with excellent trial scenes ennobled by Nigel Hawthorne as the judge, and one who is willing to search for truth and reconciliation. Five stars to Gavin Hood for developing the story and acting it to such perfection. Though based on a true event in 1933 this story is relevant to Southern Africa today and the new South Africa. A must for discerning film goers.